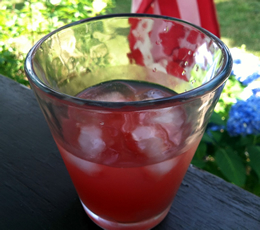 “The perfect backyard barbecue beverage,” says acoupleinthekitchen.us, creator of this cocktail. We’d have to agree! Mix all ingredients in a large pitcher and set aside for an hour, stirring a couple of times to blend. Strain mixture through a fine mesh sieve into six rocks glasses filled with ice. To serve additional drinks, simply add moonshine to pitcher, stir, sieve and pour. Drink responsibly.